So, I want to ask a question that might spark a huge, ugly debate . . .
Cookie dough or a cookie? As for me, I am totally on Team Cookie Dough. but seriously it won’t change my mind. I just have no control! When you put a bowl of cookie dough in front of me, I can’t help but eat a couple handfuls. By the time the cookies are finally done baking, I am so full of cookie dough that I can’t even bring myself to try a cookie. 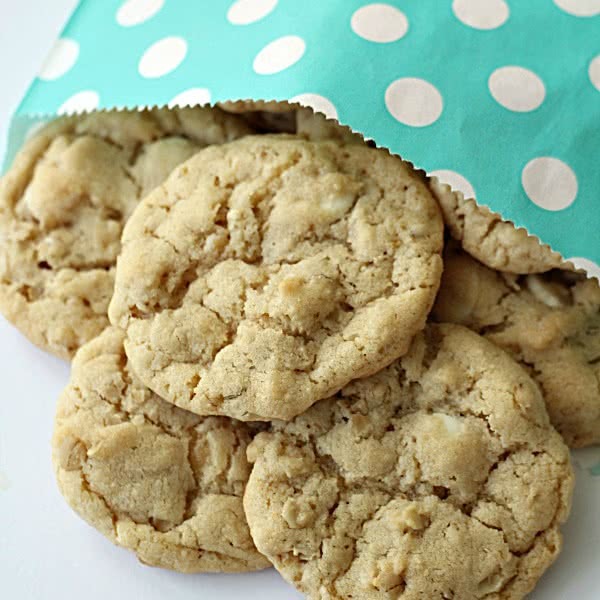 Whether you love cookie dough or cookies, this recipe is for YOU. The dough is divine (in my humble opinion), but my husband swears that the cookies are even better (but you don’t have to take his word for it). In a bowl, beat together the softened butter, brown sugar, and white sugar. Add in eggs and vanilla and mix well. Stir in the flour, baking powder, baking soda and salt until completely incorporated. Fold in the oats and white chocolate chips. Drop by tablespoonfuls onto cookie sheets and bake for 9-12 minutes (do not overcook). Remove from cookie sheets and let cool. Holy Cow!!!! These look amazing, and I am going to make them tomorrow! And yeah.....I'll be eating a bunch of dough, too! LOL I love both! I'm totally a cookie dough lover too. Sometimes I make cookies for no other reason than because I'm in the mood for some dough. I love oatmeal and white chocolate is my favorite. I will definitely make these. How do I print the recipe? Thank you. Since our blog is under construction, our print friendly buttons are not quite up and running yet. Hopefully this next week. Can you make these into pan cookies? I thnk they would be great that way. This recipe has no flour? In the ingredients it lists 3 cups of flour. We have never made them into pan cookies, but see no reason why it wouldn't work. Best of luck, keep us posted. I like cookies,but I do not want them soft and doughy in the middle. Cookie dough has a very strange texture. I am definitely Team Well-baked Cookie! I'm with you that it is cookie dough all the way!! Growing up, my mom and I would make cookie dough, eat it and never even make cookies. I have taught my girls the same thing, but now we have to actually make some cookies because my husband loves them cooked only. Have a great Memorial Weekend!! Hi, before I make these, tell me how many calories please? thanks would they still be as good if I added much less sugar? I am a cookie dough girl and can't wait to try this dough! I've tried this recipe before and it's wonderful!!! This time I added 1/4 cup unsweetened cocoa powder and 1/4 cup less of the flour. Really delicious! My family thought these cookies were awesome!! I thought the consistency was great. I did grind my oats in my food processor since I buy the old fashioned kind. I do that for all of my oatmeal cookie recipes though. Thanks for sharing this recipe. Can I use instant oats instead of rolled oats? What is the dif. between the two? We always use instant oats. Rolled oats are bigger than instant oats and take a little longer to cook. If a recipe calls for instant oats, but you only have rolled oats, no problem. Hope this helps! I just whipped up a batch of these and added some Trader Joe's pumpkin and freshly ground cinnamon. Oh my, your initial recipe was already delicious, but the extras totally kicked them up a notch! Yummy! Leave in the oven more like 12 mins until golden brown. I placed them on parchment paper and they are delicious. I got four full cookie sheets out of the recipe. I will definitely be baking these again. Don't make these with margarine- they spread out into one big carmalized pan cookie mush- not pretty! These cookies are heaven! Another great recipe from six sisters! Made these once before and the whole house loved them so Im making them again today. Awesome cookie recipe! So it has to be butter, not margarine? Also, how many cookies does this recipe make? You could make this recipe using margarine too. Or even half margarine and half butter. We have done that before in recipes.